The Guidance system in Notre Dame is designed to help and support all our pupils throughout their secondary schooling. When your child enrols in Notre Dame, he/she will be assigned to a Guidance Teacher. Each pupil will have the same Guidance Teacher from first year right through to the time they leave school. In addition to their normal teaching responsibilities, Guidance teachers have a specific role in helping and supporting the pupils in Notre Dame. They will get to know the pupils very well and they are the first people our pupils or parents should turn to if there are any difficulties. Guidance staff should be the first and main point of contact between school and home. Of course, all teachers in Notre Dame support and care for our pupils. 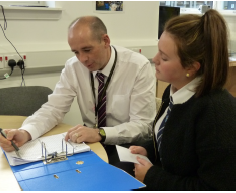 This pastoral care of pupils is achieved by a system of ‘First Level Guidance’, by one to one interviews and by pupil, group and year assemblies. This care, provided in partnership with the home, will ensure that pupils achieve all they can at Notre Dame. The Guidance system is structured “vertically”. This means that each Guidance Teacher has the responsibility for a group consisting of pupils from first year to sixth year. To get a better idea of the important role played by Guidance Teachers, we should look at some examples of their work. Working with our Associated primaries will ensure a smooth transition from primary to Notre Dame. Close monitoring of pupils’ classwork and general progress. Liaison with staff and parents regarding pupil progress. The organisation of the Senior Phase Options Programmes. Personal and Social Education Programmes.